The basic rule in any weight-loss program is that you need to burn more calories than you consume to lose pounds. Eating a healthy, low-calorie diet and exercising is the best, and most balanced way to do this. Running as your form of exercise burns calories, tones the muscles and works out the cardiovascular system. Once good habits are built, it makes it easier to keep the weight off. As you lose weight, you may find that you are able to run faster and for longer periods of time, but you will burn fewer calories because you have less weight to lug with you. Cardiovascular exercise is one of the most efficient ways to burn calories, and running is at the top of the list of calorie burners. A person who weighs 155 lbs. and runs for 60 minutes at a rate of 7.5 miles per hour will burn 930 calories, and a 185-lb. person running at the same rate and length of time will burn 1,110 calories, according to Harvard Medical School, almost twice the amount of other cardiovascular exercise, such as aerobics or tennis. 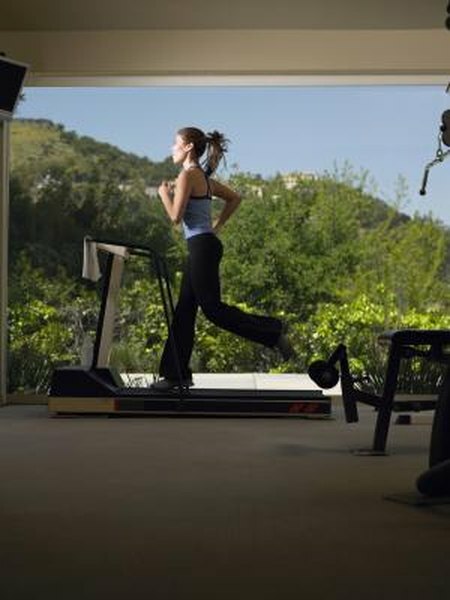 Running on a treadmill is less stressful on the joints but won't give quite as much of a workout as running outdoors or on a track, although the amount of calories burned is similar. When running to lose weight, the American College of Sports Medicine recommends working out for 60 to 90 minutes five times a week. Start by running close to the 60 minute mark, gradually increasing the intensity, time and mileage. If just starting an exercise program, it's best to start by walking and work your way up to running. Varying the workout with interval training -- periods of running mixed with brief periods of walking -- will help you avoid burnout and keep the muscles fit. A good weight-loss program includes eating a proper diet with healthy foods and lower calories. If you do not consume more calories than you burn, running for 30 to 60 minutes at a moderately intense pace for five times a week is enough to keep your weight in balance. You must burn 3,500 more calories than you consume to lose 1 lb. of fat. Dropping 500 calories from your daily consumption, either through eating less or exercising more, will help you lose a pound of fat in one week. Once you have reached your desired weight, continue eating healthy foods and maintain a balance between calories consumed and expended; this will help keep the weight off. Consult with a doctor before beginning any weight-loss program. Running requires only a good pair of shoes and space to run. Buy a good pair of running shoes so your feet are supported when you are running. This can help avoid injury and wear-and-tear on your feet and toes. Avoid trying to lose weight too quickly. Building good eating and exercise habits while you are losing weight will make it easier to keep it off and will keep you healthy.